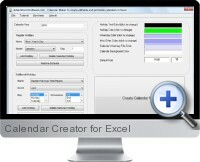 The Calendar Creator for Excel enables the automatic creation of editable and printable calendars in Excel. The Calendar Creator interface allows the input of options such as year, holidays, and color formats and creates an editable Excel calendar accordingly with the click of a button. Created calendars and be easily edited, used and printed in Excel. Calendars are highly customizable for use in business, education institutions or personal use by defining holiday information, color schemes and much more. Calendars can be used to track activities such as project management tasks.